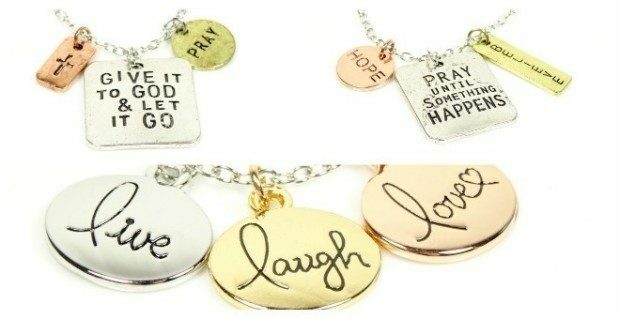 Inspirational Faith-Based Tri-Tone Stamped Necklaces Just $4.99 (Reg. $20)! You are here: Home / Great Deals / Christmas Deals / Inspirational Faith-Based Tri-Tone Stamped Necklaces Just $4.99 (Reg. $20)! Head over to Jane.com to order one or more of these beautiful Inspirational Faith-Based Tri-Tone Stamped Necklaces for Just $4.99 (Reg. $20)! These gorgeous tri-tone necklaces make perfect gifts! They include inspirational stamped sayings in 3 colors, including antique silver, antique copper and antique gold! There are 11 different sayings to choose from and at only $4.99, they will make great stocking stuffers! !